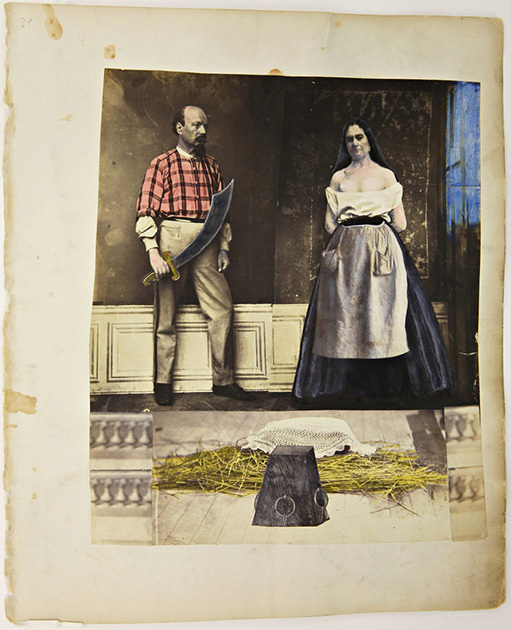 In the early 1990s, an album of approximately 50 double-page photo collages was discovered in France. 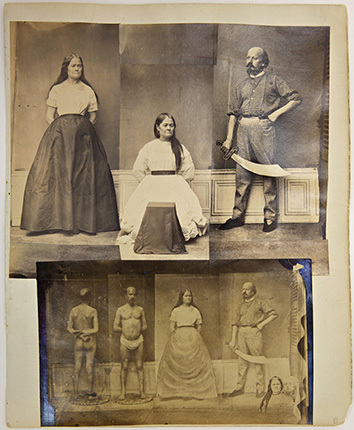 Based upon the photographic techniques employed and from the fashion of clothes and hairstyles depicted, the album most probably dates from around 1860 -1870. 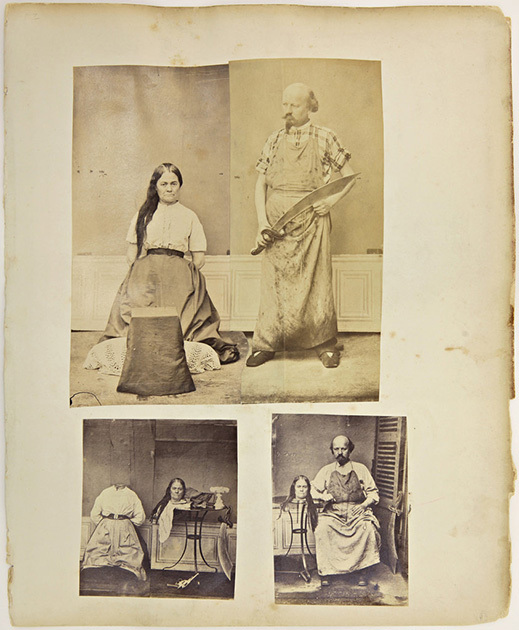 One of the photographs shows the newspaper La Lyonnaise, suggesting that the works may have originated in Lyon. 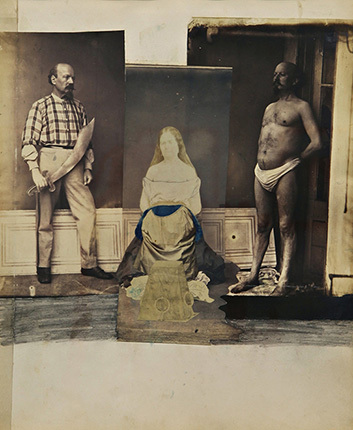 The album has been disassembled over the years and the works dispersed, some are now included in various private and museum collections, including that of the Musée d’Orsay. The author of the album is unknown and remains anonymous up to the present time. 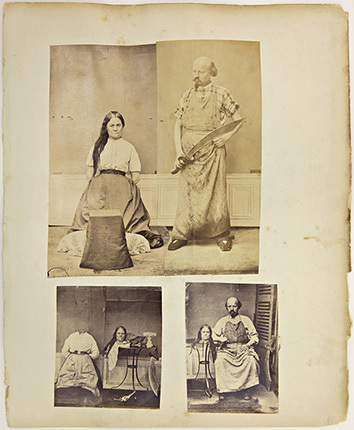 An excerpt of the album was published in 1993, together with works by Hanne Darboven. 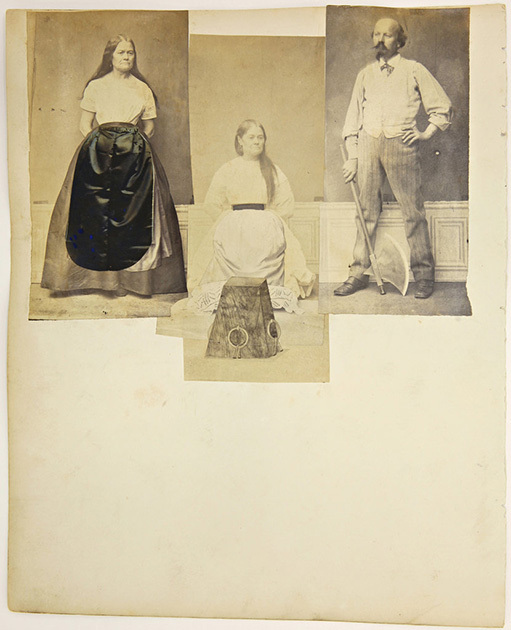 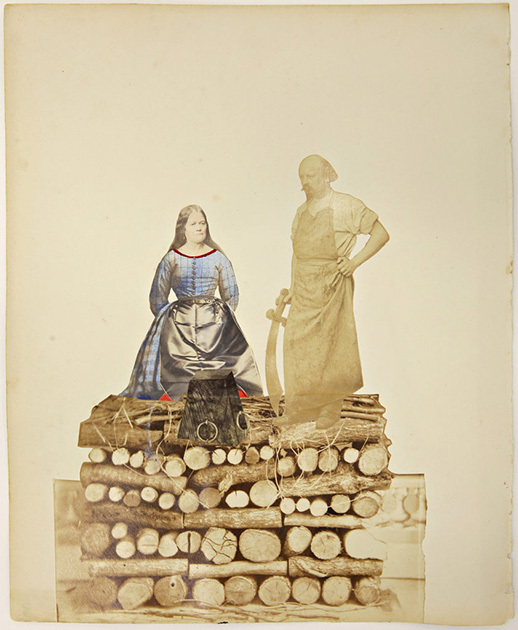 With the development of photography on paper, the first manipulations of photographic images occurred through the cutting of negatives and through the effects resulting from double exposure and overexposure (for example in spirit photography) as well as the technique of collage. 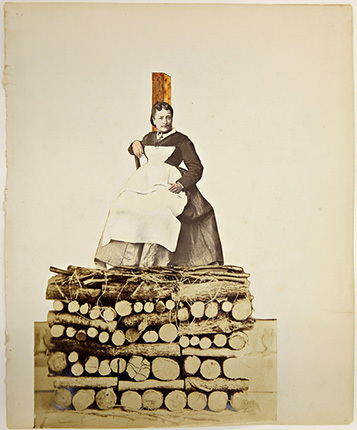 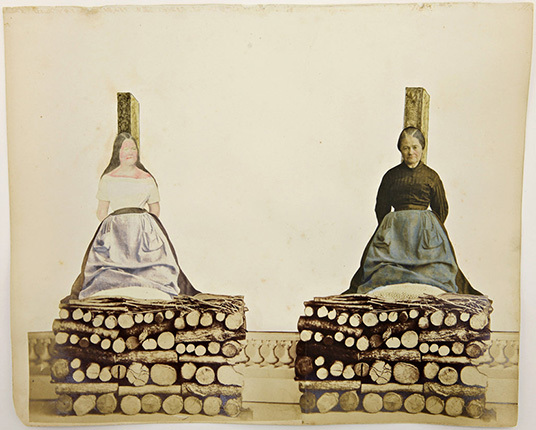 Since the end of the 1850s, various materials have been combined with the photographic print (for instance cut paper, water coloring, pieces of fabric or lace) and were the preference of upper class Victorian ladies, often with playful and imaginative elements as decorations in family and friendship albums. 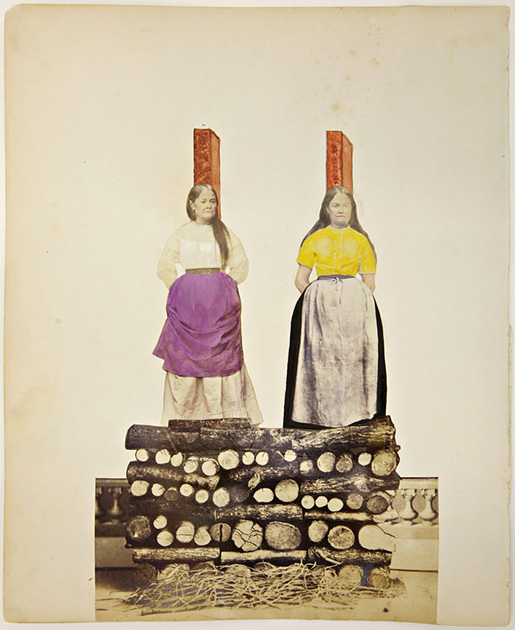 Although quite different in subject, examples of these common techniques can also be found in the album: photo collages of women at the stake as well as before or after decapitation gave vent to their author’s phantasies, barely concealing a deep-seated sexualized undercurrent in the work. 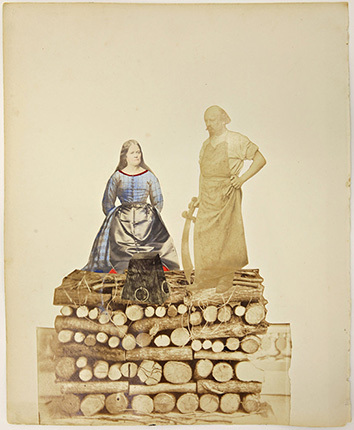 The technical virtuosity of the work suggests the hand of a professional commercial photographer with access to photographic equipment and a darkroom as well as contacts with female models which he brought to bear in this unusual work without them realizing precisely how their portraits would finally appear. In this respect, the collages are at the same time unconventional and exceptional. Individual sheets of the album bring to mind tableaux vivants denoting a clear influence of the theater in their composition. 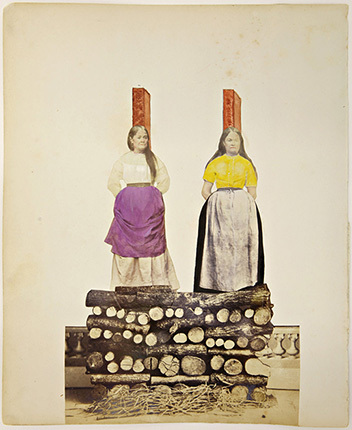 With repetitive citations of artworks and classical poses they testify to a manifest degree of artistic knowledge: depictions of martyrs and decapitations in paintings may have served the author of these collages as models in content and form like Paul Delaroche’s at the time already famous paintings The Decapitation of Lady Jane Grey (1833) or Herodias with the Head of John the Baptist (1843). 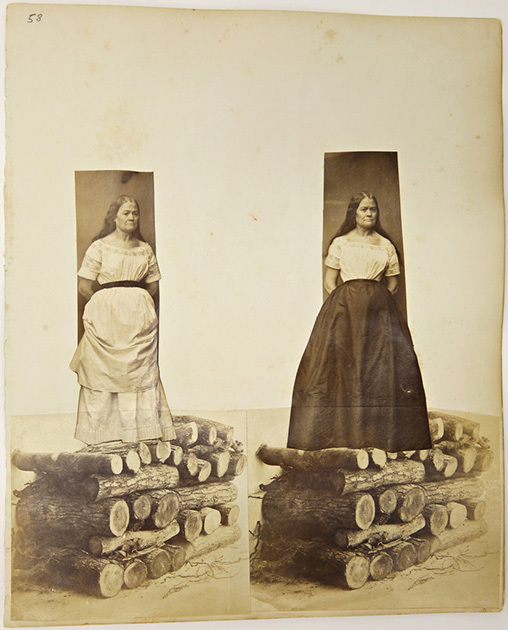 The incident of the so-called “Murderer of Maids” may have inspired the photographer’s imagination: Between 1855 and 1861, Martin Dumollard had murdered numerous young women near Lyon with the supposed assistance of his wife. 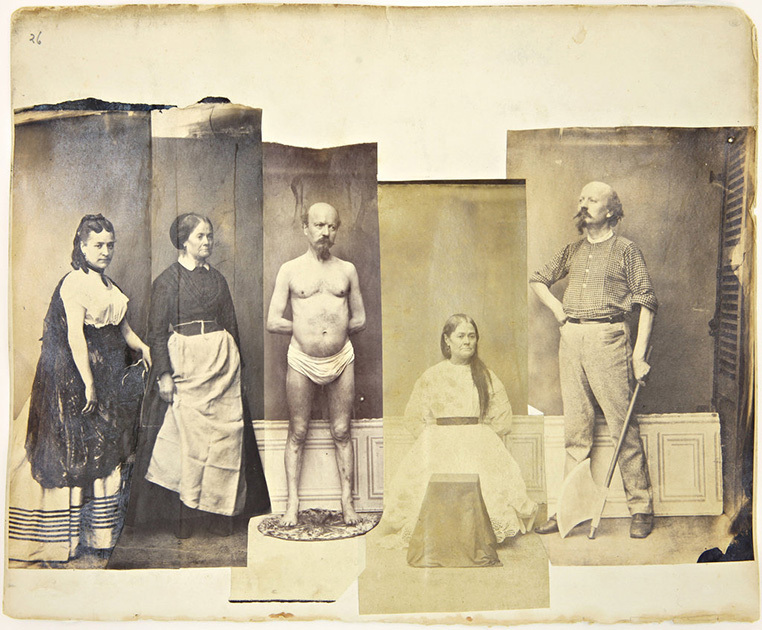 At the time, the incident became a media phenomenon inspiring the collective imagination of the public far beyond the borders of France.